There's a lot of FIFA 19 formations to choose from in the latest footballing extravaganza, but how do you know what the best FIFA 19 formations are? That's where we come in. Whether your preferred style of play is tiki-taka or route one, five-at-the-back or non-stop crosses, we've taken a look at all of the formations in FIFA 19 and narrowed them down to eight. To help you find your perfect setup, GR has formulated a list of the best FIFA 19 formations for use across the game, whether ploughing through career mode or trying to amass FIFA 19 weekend league rewards in Ultimate Team. Get to know two or three inside out so you can switch between them when you want to park the bus or are gunning for a last-minute winner. Then team them with our FIFA 19 tips for an even stronger competitive edge. Diamonds are forever in FIFA: this formation has been strong for years, and in FIFA 19 it’s still the best setup for controlling the middle of the park. Having four midfielders close together gives you the lion’s share of possession, while your CDM helps protect against counter attacks. The key is having a CAM that can both feed your front men and smash goals in from the edge of the box. If you can get them the ball, it’s a nightmare to defend against: your opponent won’t know whether to bring out a centre back – leaving a striker open – or back off, which opens the door for a long shot. You often find your CAM leads the team in both goals and assists. It works best if you have two true box-to-box midfielders and pacey strikers that can stretch the defence: consider telling your attackers to “get in behind” on team instructions to create through ball opportunities. Solid full-backs are essential for providing much-needed width, as well as snuffing out attacks down the flanks. It’s better against the CPU than online, and a savvy Ultimate Team opponent who’s good on the wings will often get the better of you. But if you’ve packed your career mode team with strong midfielders, it’s a perfect fit. Seeking players to mould into this formation? Then you need our FIFA 19 ratings guide, tracking those who’ve made the biggest stats leaps since last year’s game. Two defensive midfielders are key to this balanced formation: they’ll cut off passing lanes between your opponent’s midfielders and strikers, making interceptions and providing a base from which to launch counters. You’ll need them to have good fitness, because on the default settings they’ll get forward to support your attackers, too. The wide men are attacking midfielders rather than conventional wingers, which means they’ll cut inside to combine with your CAM. It feels fluid, especially if you give that CAM a free role. Consider telling your striker to get in behind, because you’ll have plenty of chances for through balls. If you’re looking to hold onto a lead, you can use the same personnel but switch to 4-2-3-1 Wide, which essentially pulls your two wide midfielders back into conventional right and left wing positions. You’ll frustrate your opponent with two banks of four, and you’ll have lots of passing options to keep possession in midfield when you steal the ball back. A versatile FIFA 19 formation with plenty of attacking potency. Its right and left forwards make it tick, and in team instructions you can tell them to drift wide, cut inside, get in behind, or drop back in a false 9 role, which means you can easily customise it to fit your personnel. It’s also the perfect setup for taking advantage of FIFA 19’s finesse shot: if those wide forwards can cut inside onto their stronger foot, it’s game over. If online opponents try to take away the inside lane, then simply burst down the wing and drive a cross into your striker. Don’t be surprised if your midfielders flood the box too. It’s adaptable, so you can use it whether you need a goal or you’re hanging onto a lead. Your left and right forwards can drop back and mark opposition wing backs if you need them to (just edit their player instructions), and defensive-minded centre mids can make it tough to break down. If you’re not asking those wide forwards to drop back, consider pulling the central of the three midfielders back as a CDM to protect your defenders. This is one of the best formations for scoring goals in FIFA 19. Your CAM is the centrepiece, and if given a free role forms the perfect link between midfield and attack. It also gives your wingers space to operate, letting your star wide man beat their full back and whip a ball into your striker. The two centre mids should be box-to-box players, and I recommend changing your instructions so that one stays back while attacking. They’ll still support the team when you attack, and be able to switch the play, but pushing one further back protects against any quick breaks. Your other centre mid will push on into the box to get on the end of your crosses, and often make runs beyond your CAM, which can cause chaos. If you’re up against a superior player, or protecting a lead, I recommend switching to something else. You essentially have four attacking players here, and even if you tell your two wingers to come back on defence it’s easy to get overrun. But if you’re looking for a goal, or you think you can control a match, there are few better formations. A rock solid FIFA 19 formation that’s hard to break down, largely because of those two defensive midfielders shielding your back four. They track any attacking midfielders and cut out any direct passes through to strikers. If you have lazy wingers, they can also cover out wide. Don’t expect those midfielders to push up on attack, though: you’ll be relying on pace down the wings to create chances. But that’s okay: wing play, and crossing in particular, is very strong in FIFA 19. I recommend two strikers that can head the ball to get on the end of those crosses, and don’t be afraid to tell your wing backs to overlap to provide an extra threat. If you need a goal, then switch to something more attacking, but it’s perfect for establishing control early in a game. Goals, goals, all types of goals. The 4-5-1 Attacking gives you passing options out wide, through the middle, or in behind. Don't worry about having to play long balls to your attackers: your wingers and attacking midfielders drop back to pick up the ball, and support each other going forward. When gaps open up in your opponent's defence, expect to see your midfielders burst through into the box for one-on-one chances. Given that you only have one centre midfielder, you can get overrun through the middle, especially against online opponents. But attack can be the best form of defence: you see a lot of the ball, and if you play a high pressing game it causes panic. It works best offline, and the CPU often struggles to play the ball out of defence, instead hoofing it forward to your centre backs. Win the header, recycle, and launch another attack. It’s not glamorous but sometimes you’ve got to unleash your inner Tony Pulis to get things done. In previous years, you’d be hard-pressed to work with such a defensive formation. This year, it’s not only a viable option, but almost a necessity at times thanks to how you’re allowed to frustrate the opposition by digging in. Specific player instructions should be as follows: CBs set to conservative interceptions, one CM set to Get Forward, while the rest should be left as normal. Your striker should also have False 9 set under Attacking Runs so they’ll always be available as a quick passing option. Sometimes you just desperately need a win – but when you’re down and needing to rush passages of play, it can be pretty disheartening. That’s where 4-2-2-2 comes in. Having each of your attacking midfielders set to free roam can really cause havoc for the opposition, as you’re essentially playing a 4-2-4, while still maintaining enough defensive rigidity so that you never truly get caught on the counter. For an extra advantage, I’ve found that – especially offline – using the Defensive Style ‘Pressure on Heavy Touch’ can reap real rewards. The AI is still pretty green when it comes to being put under any real stress. The real kicker for this FIFA 19 formation, though, comes in its flexibility: you can mould the attacking and defensive instructions to how you want to play, you’ll just have the benefit of having an extra man over at all times. FIFA 19 is out now, and it’s easier than ever to make millions in the game’s biggest mode. 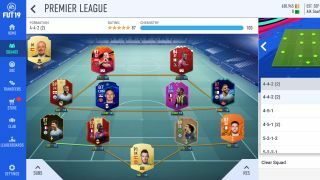 All is explained in GR’s FIFA 19 Ultimate Team coins guide.